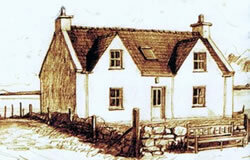 Taigh Mo Sheanair [My Grandfather's house] is a traditional cottage in a scenic location by the sea with moorland views. Upstairs has 2 bedrooms consisting of 1 double and 1 twin. There is also a bathroom upstairs. Downstairs there is a kitchen/diner, a shower room, the laundry and a living room with open peat fire. We also have a cot & high chair available. Pets are allowed and the property also has an enclosed garden and parking. For cost & availability please e-mail or phone.